Professors at graduate schools of business and journalists who specialize in business are being quoted in articles across the country on the subject of General Motors’ (GM) failings. Most of the focus is on GM’s corporate culture. But everything about the company, in our country and around the world, is under scrutiny, from its values and practices to its organizational structure. In short, the subject is huge. There is much to be learned, and that which is learned will need to be applied. Learning and application will take place not just inside General Motors Corp., but in the domains of business education and journalism too. It seems reasonable to ask why there is no comparable interest or scrutiny, on the part of professors of public administration and journalists who cover government, about, say, the failings of the Veterans’ Administration, or the shortcomings of Affordable Care Act implementation, or the unmanageable Defense Department described by Robert Gates in his book Duty. In these cases there is only silence from academia and journalism. Why is this? The reason, of course, is that the performance of government agencies is regarded as political, not organizational. The longstanding and virtually unquestioned worldview about institutions of government is that everything that matters is political. If the Veterans’ Administration has a failed culture, it is a political failing. If Health and Human Services can’t get its act together, it is a political failing. When the Department of Defense is unmanageable, that too is a political failing. In other words, failures of government institutions are always seen to lie at the top of the government hierarchy, where elected officials (“policymakers”) issue directions (“policies”). No matter what goes wrong, we blame it on “unworkable policies.” We apply this same worldview to state and local government too. But consider that no one in a policymaking position at General Motors Corp. ever promulgated any policies that could be said to have caused the company’s current troubles. No one ever directed that the company develop its counterproductive culture; no one directed that management, engineers, attorneys and safety officers keep what they knew to themselves, in their “silos.” No one directed that the company risk its very existence by denying the truth about its mistakes. None of what happened at General Motors Corp. was directly caused by policymakers. Combinations of incompetence, negligence and dishonesty mixed with the corporation’s history, culture and practices indirectly caused everything that happened. Just like General Motors Corp., government institutions have histories, cultures and practices that evolved independent of policies. Just like at General Motors Corp., some people in government are incompetent, negligent and/or dishonest. It follows that some government institutions are highly capable of implementing the policy directions they receive from policymakers but others are not. Some agencies have histories of exemplary performance, but others don’t. Some agencies adapt well to changing circumstances and some do not. Just like at General Motors Corp., most of the attributes that apply to agencies of government bear little or no relationship to the policy directions that come from policymakers. Whether we like it or not, it is an everyday truism that institutions made up of frail human beings develop personalities and practices that no one ever intended. Institutions of all sorts thwart, as well as implement, the intentions of their policymakers. It is one thing for academicians and journalists who study and cover the public sector not to be interested in anything other than policies and policymakers. It is another thing to seriously believe that nothing but policymaking matters. Every day, at every level of government, one finds manifest proof that a great many things that have nothing to do with policy matter a great deal. Despite the fact that our formal academic worldview denies the importance of anything except policy, most people involved in the discipline know better. 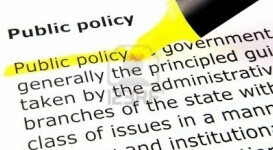 That this is true may explain the appeal of studying “public policy” in lieu of, or even in addition to, “public administration.” The term “public policy” neatly dispenses with the whole problem of things of consequence that are not policy-related, by clearly declaring a narrow focus limited to policy. When it finally does become an accepted truth that the world of policy is only one part of a larger whole, which is bound to happen sooner or later, it will not matter to the field of public policy, because that field will be on record as not being interested in the larger whole. If the name of the field is “public administration,” on the other hand, the exclusive focus on “public policy” looks and feels narrow and unsatisfactory. The inescapable truth is that the worldview of “public administration” is narrow and unsatisfactory. To be sure, it is intellectually rich. However, its intellectual richness implies, mistakenly that government’s deficits are intellectual deficits that could be made up for by better “policies.” If only it were true! No one doubts that policymakers and policies are of the utmost importance. The notion that they are the only things that matter, however, is clearly absurd. Reflective of the human condition, government agencies experience General Motors Corp.-type issues in the same measure as the private sector. What we call “public policy” encompasses only a part of the public sector, just as “corporate policy” constitutes only a part of what happens in the private sector. If we care about the results government institutions produce, we must broaden our perspectives. The public sector can no more afford to ignore organizational realities than General Motors Corp.